Street drugs shaped to look like popular cartoon characters have been showing up in places like Kansas City, but law officers say they don’t appear to be prevalent in Iowa. The brightly colored pills are often designed to look like Homer or Bart Simpson, Teenage Mutant Ninja Turtles, Transformers or Snoopy. Officials worry that children could mistake the dangerous drugs for vitamins or candy. Brad Thompson is the assistant director of the Iowa Division of Narcotics Enforcement. “We’ve been very fortunate in the fact that (Iowa) has not seen some of these other national trends as it relates to marketing specifically to children or younger adults,” Thompson said. “I mean, sure there are some things out there we may not be aware of, but as far as any trends developing, we’re not seeing those in Iowa.” Thompson says parents should always be looking for warning signs that their child might be using drugs. “You have to look for changes in normal behavior, especially as it relates to school and social skills. Bascially, anytime you see anything unusual in your children, I think you have to look at what the cause may be,” Thompson said. Tests conducted on the drugs turning up in Kansas City have found traces of methamphetamine and heroin, though drug dealers are marketing the pills as Ecstasy. 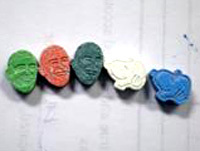 Some of the tablets are also shaped like President Barack Obama’s head. Find out more about talking to kids about drugs at the Partnership for a Drug Free Iowa website .